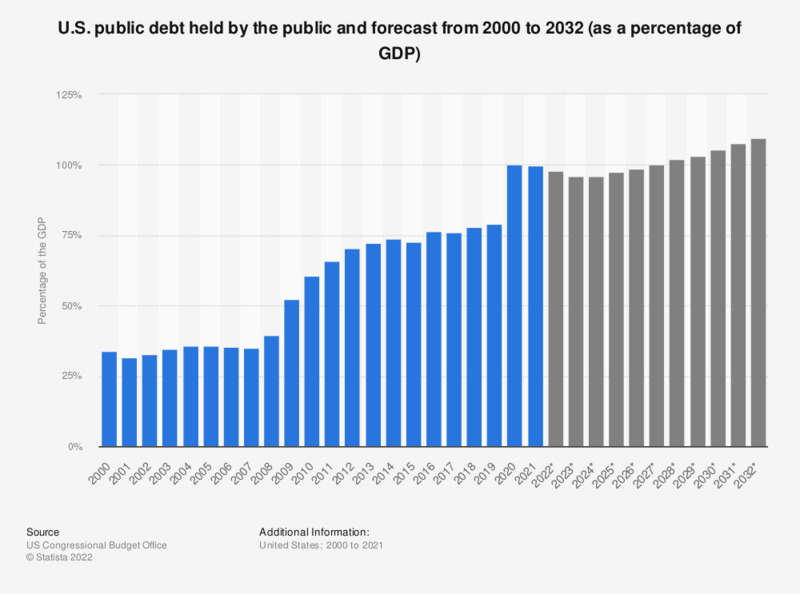 The statistic represents the U.S. public debt held by the public from 2000 to 2018 with an additional forecast from 2019 to 2029 as a percentage of the Gross Domestic Product. U.S. public debt held by the public amounted to 15.75 trillion U.S. dollars in 2018, which was about 77.8 percent of the U.S. GDP. The forecast predicts an increase in public debt up to 28.74 trillion U.S. dollars in 2029, which would be about 92.7 percent of the U.S. GDP. The actual total debt accrued by the U.S. annually can be accessed here. Everything On "Personal debt in the United States" in One Document: Edited and Divided into Handy Chapters. Including Detailed References. Statistics on "U.S. public debt"
Overview on public debt in the U.S.